Now that many people own smartphones that can also be used to receive business emails or other important messages it can become tiresome to keep picking the device up, especially if you are at work in the office. Today we have something that may help with this problem that is called the Krome app for Android, which will place your notifications onto a desktop. If you get a lot or emails or text messages to your mobile device there is now a way to have all of this information appear on a desktop display. First you have to install the Krome Android app that is available via Google Play, and then go to the Google Web Store and install the free Chrome extension. Once installed to your mobile device the app will let users enable accessibility access so it can read notifications, and then you are provided with a code to enter on the desktop to finish the setup. Then any notifications that are sent to your device Krome will replicate them on the desktop via a small popup window in the corner of the screen. 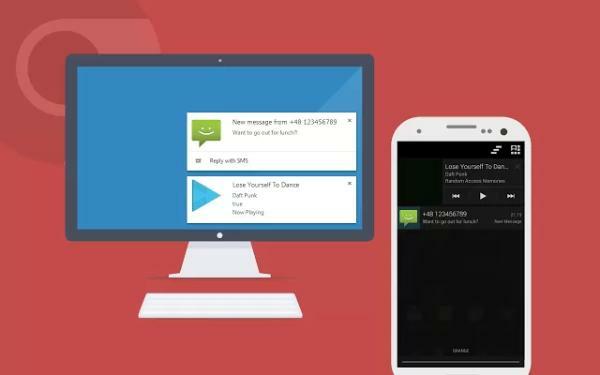 Anything that hits your notification bar is then displayed on your desktop and the app uses a secure connection to transfer the data, which are done via the Google Cloud Messaging service. Small parts of the data are kept on the servers but as soon as they arrive on Chrome they are deleted. Users can even send SMS messages but this can also be switched off via the settings. To find out more head over to Google Play and Krome costs Â£0.50/$0.99, and the Chrome extension can be found here.